After the 1989 Loma Prieta Earthquake I managed a research contract with Prof. Saiidi at the University of Nevada in Reno to look at how cable restrainers performed on bridges including on the San Gregorio Creek Bridge (35 0030) that carries the Pacific Coast Highway. The bridge was built in 1941 and retrofitted with restrainers in 1984. It is a five span haunched T girder bridge that is 266 ft long and 31 ft wide. 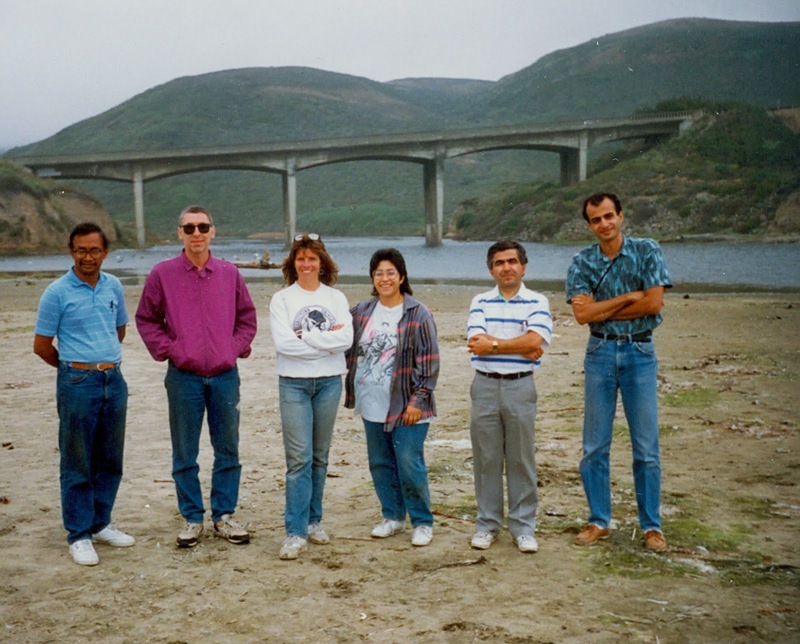 In the photo above Prof. Saiidi (second from right) is standing with his students (and me) on the beach in front of the bridge. San Mateo County, California Bridges: State Route 1 Bridge across San Gregorio Creek (1) by Mark Yashinsky is licensed under a Creative Commons Attribution-NonCommercial-NoDerivatives 4.0 International License.